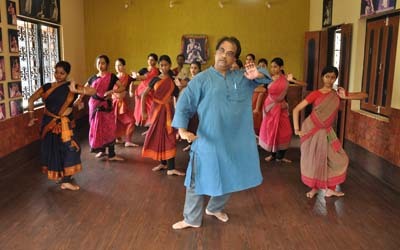 A vitally important part of Guru Kelucharan Mohapatra's legacy is the Summer Workshop at Srjan. The gathering of students from various parts of the world for the workshop always created in Guruji a lasting enthusiasm and joy, which all of us had the privilege to share in, year after year. And after Guruji tragic demise, we at Srjan renew our resolve to continue the tradition, which he himself gave distinctive shape and colour to. He may not be there in person, but his creative and artistic presence, his undying passion for Odissi will be with us at every step along the way.You are cordially invited to participate in this unique learning experience in Odissi dance. The Summer Workshop will have a duration of two months (1st May to 30th June every year), and we will consist of four separate training programmes of 15 days duration each: participants according to individual convenience, are free to choose one or more of these programmes. We assure you of our finest efforts in carrying forward Guruji's magnificent obsession with Odissi dance and its successful teaching. * Detailed information on days and timings will be available by clicking terms and rules . Interested participants/dancers are required to fill up the enclosed application form in capital letters and confirm his/her participation in the Summer Workshop by ensuring that the completed application form reaches the Srjan office two weeks prior to his/her arrival. At the time of admission, each participant/dancer is required to pay INR 2000/- (non refundable) towards admission fees. In order to be eligible to participate in the summer workshop, the participant/dancer must be 14 years old or above. He/She is required to have a minimum of four years’ learning experience, and should have learnt steppings, Mangalacharan, Batu, any Pallavi, and Abhinaya. Any exceptions are subject to the approval and consent of the Director, Srjan. 3. Photocopy of the participant/dancer’s Voter ID, Driving License, or Aadhar Card. If the participant is a minor, photocopy of the Voter ID, Driving License, or Aadhar Card of the participant/dancer’s parents. 4. Photocopy of the passport, visa page & arrival immigration stamp page of the passport for foreign students only. • Attending both the sessions of the workshop (from 1st to 30th May). 2. The fees have to be bank transferred prior to your arrival. Please note that once the money is transferred, the course fees is non refundable. 3. Participants/dancers who attend classes only for a certain number of days (and not their entire course duration), or less than fifteen days during any of the above sessions (Session- 1 or Session- 2) will be required to pay the full course fees. Participants/dancers may arrange their own boarding and lodging. Participants/dancers who opt to stay at Srjan's hostel accommodation throughout the duration of the course need to pay additional fees for boarding and lodging. Those who wish to avail this facility are required to mention the relevant dates in the application form. Availability is subject to space available in the hostel at that time. Please note that there will be an additional tax (GST) of 18% on all the above fees. 1. From Monday to Friday, the supervised dance learning time will be two hours per day. 2. There will be lectures/demonstrations on Saturdays & Sunday mornings. 3. There will be no class on Saturdays & Sundays. 4. The above lectures & demonstration will be held by visiting faculty, and will include an interaction session with the participants/dancers of the workshop. 5. The content of “Class timings & Others” is subject to change. Participants/dancers are requested to keep their valuables such as gold ornaments, cash, watches, passport, necessary documents, etc. in their own custody. Srjan- Guru Kelucharan Mohapatra Odissi Nrityabasa will not be responsible for the loss of any personal belongings. 1. All issues (if any) must be reported only to the Director, Srjan or the Director’s authorized nominee. 2. 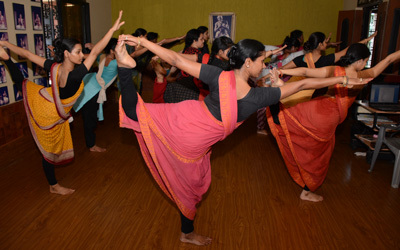 Participants/dancers cannot request for a change of teacher, or their place of stay without prior and written approval of the Srjan Director or the Director’s authorized nominee. 3. Participants/dancers must come back to their place of stay not later than 9 p.m.
4. All participants/dancers must report for classes punctually. If there is any delay in reporting for class, the dancer will not be allowed to attend that particular session, or the full day’s session. 5. In case a participant/dancer is absent for a class, the onus is on him/her to make up for the dance, or theory taught in his/her absence, and the faculty of Srjan are not obligated to spend extra time with the absentee for the same. 6. Participants/dancers who are keen to purchase any recorded music for specific dance items will be required to pay INR 2000/- per item. 7. In order to maintain consistency and continuity of the teaching methodology, as well as for future ready reference (which will be stored permanently in the Srjan archives), the Director of Srjan will set in place a system of comprehensive video recording of any or all teaching sessions, and any public or private performances during the course of the summer workshop. 8. Srjan reserves the right to record dance practice sessions, performances, lectures, demonstrations, and any interviews of the participant/dancer conducted by the institution during the course of the workshop. 9. All legal proceedings will be restricted to Bhubaneswar jurisdiction. 10. Srjan's decision in all matters will be final and binding on all students. 11. The fee structure and course content are non-negotiable. The above terms and conditions are accepted by me.